You are on a rowboat in the middle of a large, perfectly circular lake. On the perimeter of the lake is a monster who wants to eat you, but fortunately, he can't swim. He can run (along the perimeter) exactly $4\times$ as fast as you can row, and he will always run towards the closest bit of shore to you. If you can touch shore even for a second without the monster already being upon you, you can escape. Suggest a strategy that will allow you to escape, and prove that it works. If two paths take the monster to this location equally quickly, he will arbitrarily choose one. The monster can reverse direction instantaneously, and you can turn your boat instantaneously. Follow up: What is the minimum speed of the monster (relative to your boat) such that escape becomes impossible? First of all, row out to a radius $R/4$ (where the lake has radius $R$) keeping you, the centre of the lake and the monster in a straight line - with you on the far side to the monster. This is always possible; radius $R/4$ is the first point where the angular speed you can achieve just matches that of the monster as he runs round to get you. You are now a distance $3R/4$ away from the shore, directly opposite the monster so he needs to run a distance $\pi R$ to get you. You will take time $3R/4V$ at speed $V$ if you now row directly towards the nearest shore, and he will take $\pi R/4V$, which is fractionally greater. For the followup: If instead of $4\times$, the monster runs $N\times$ your speed... then you row out to radius $R/N$, you then take time $(N-1)R/NV$ to reach shore and he takes $\pi R/NV$ to reach the same point. You escape provided that $N < \pi + 1 \approx 4.1459$. It is possible to escape a monster that is a little more than $4.6$ times faster. Given a monster running at speed $X$ times rowing speed and a lake with radius $R$, you must first row to the circle that is $R/X$ from the centre of the lake by spiralling out while keeping the centre of the lake between you and the monster. Thereafter you should take a route that is tangential to this circle in the opposite direction of what the monster is currently running. This is longer than going the direct route to shore, but the monster also get a longer route to run. Your path in red, monster path in green. 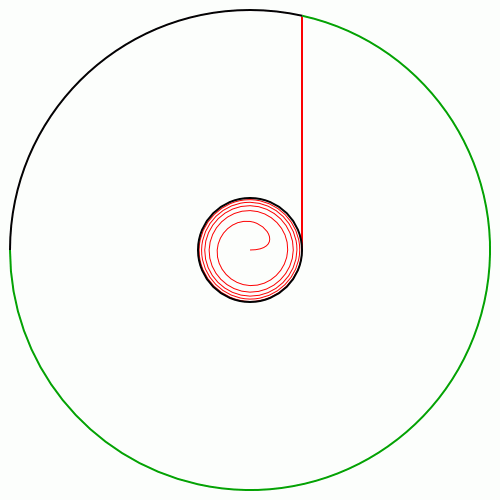 The shape of the inner spiral is not exact. Why is this exact solution best? Because of differential maths. That is a long explanation, personally I find that stuffing some equations into Wolfram Alpha works. The monster wants to eat me, but he is also particuarly fond of my boat since "he will always run towards the closest bit of shore to your boat." So I row the boat in one direction and then jump off and swim in the opposite direction. Even the fastest monsters would never catch me! Not the answer you're looking for? Browse other questions tagged mathematics logical-deduction strategy pursuit-evasion or ask your own question. How fast must Jerry swim?